While Binyamin Netanyahu apparently felt that elections were necessary at this time, the elections could not be coming at a worse time for accountants in his Likud party – as well as for the people in charge of the money in Kadima, the Labor Party, and the National Religious Party/Bayit Yehudi: All four are basically broke. In fact, 13 of the 18 parties in the Knesset are in the red. The situation was even worse at the end of 2011, the State Comptroller said in a report Monday. Since then, most parties have managed to somewhat reduce their debt levels. But many are still facing serious money problems. Labor, for example, has NIS 42 million in debts, and currently does not have any way to pay it off. Kadima owes NIS 31 million, while the NRP/Bayit Yehudi owes NIS 17.5 million. The report praised that party, for reducing its debt by 45% since the beginning of the year, but criticized it for getting into such a deep hole in the first place. 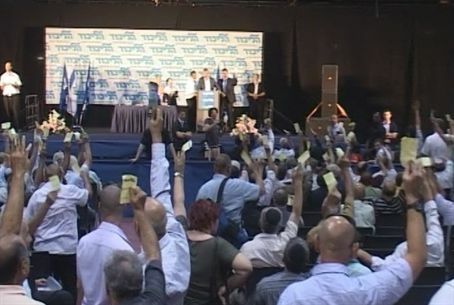 The best managed party, according to the report, is Yisrael Beteinu; the party, which had been running a minus last year, is now in surplus, with NIS 2.4 million in the bank. While many of the parties have been cutting back in order to pay off their debts, the report said, the Comptroller's Office feared that they would end up even worse off in the coming months, as they spent money on the new elections. The report also discussed a number of improprieties in spending, with parties improperly using funds for a number of purposes. However, none of the parties engaged in outright illegal activities, according to the report. In particular, the report criticized the Likud for spending some NIS 50,000 to feed 120 people at a recent breakfast hosted by Prime Minister Binyamin Netanyahu. That comes to NIS 418 per guest, a sum, the report said, was a ridiculous amount to spend on a meal, especially breakfast, even if the Likud could properly account for the outlay.